Checking the local newspaper today, I found an article focused on plans to build a bullet train from Savannah, GA to Chattanooga. High speed rail is touted as the transportation solution of the future. The rail system in Europe functions as the backbone of transportation on that continent. I understand that it is very important in Asia as well. There was a time when rail was the precursor for development in the United States. A grand majority of towns in the interior US were built with their faces turned toward the shiny rails that brought the big steam locomotives. Knoxville, though founded well before train travel, was much affected by the rise and importance of the railroad. Knoxville, being a larger city, had two major railroad stations, the L&N and the Southern. 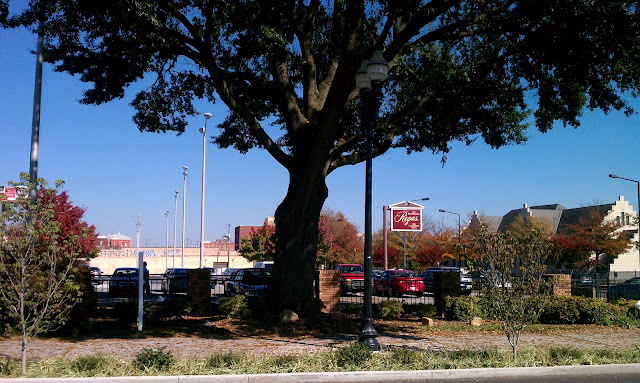 The L&N, located in what is now the World's Fair park, is now more likely to pop into the minds of modern Knoxvillians when presented the terms "Knoxville" "Train" "Station." 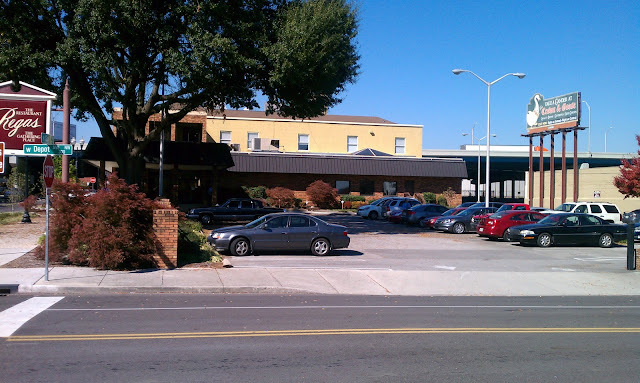 However, in the early 20th century, it was the Southern Railroad Station that was doing much of Knoxville's passenger and freight railroad business. The Southern Railroad Station is located across the tracks, north of Summit Hill on the north end of downtown. It is somewhat cut off from the rest of downtown by the tracks, but the Gay St. viaduct made it very accessible. After it was constructed, a small city of hotels, restaurants, shops, and warehouses sprung up to serve the railroad and its travelers. If one were to get off a train at the Southern in the 1920's, they would find a bustling community, ready to meet almost any need. Today, however, that traveler would find almost nothing. They wouldn't find depressed shops, nor would they find abandoned buildings. They would find open land paved over with asphalt and a backdrop of the I-40 viaduct. In my last post, I showed a picture which depicted a cluster of large buildings in the backdrop. They're all gone. All of them! (small disclaimer, a small portion of one still stands). Empty lot on the left. Empty lot on the right. The site of our subject property. 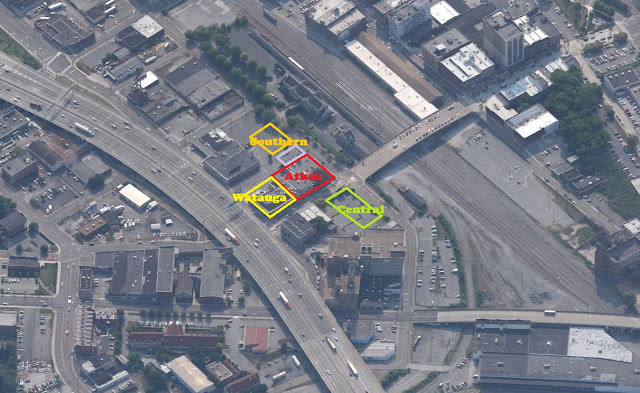 Several empty lots facing the Southern Depot (note the large tree on Gay Street). Here once stood the Watauga Hotel, the Central Hotel, the Maxwell House, the Southern Hotel, the Hudson & Essex Car Sales, several cafeterias, and our subject property the Hotel Atkin. Before we begin discussion of the Hotel Atkin, let's begin by looking at the man that was responsible for its existence and for much of what we recognize as Knoxville, C.B. Atkin. Clay Brown Atkin was born in Knoxville December 27, 1864. His father ran a furniture/mantel store on Gay St., having previously run a sawmill and owned a brickyard among other things. CB left Knoxville to attend Vanderbilt University. When he returned he entered the retail world by way of his father's furniture store. Atkin's store and furniture factory was located on the block now topped by the First Tennessee Plaza Tower, a block that it shared with Staub's Opera House. CB and his brother ultimately purchased the business from their father. That partnership ultimately fell apart, leaving CB to run the C.B. Atkin Company. CB's company became the largest manufacturer of cabinet fireplace mantels in the world. The factory at 812 S. Gay St. burned down in 1893. Mr. Atkin had it rebuilt without ever stopping the manufacture of the mantels. Atkin married Mary Burwell and the two moved to Perez Dickinson's old mansion on Main Ave. (now Main St.), which they remodeled extensively. The CB Atkin House (located roughly where First Baptist and the Bank of America Building now stand). The Southern Railroad soon presented an opportunity to Mr. Atkin. The railroad built the Coster Shop along the tracks just south of Sharp's ridge. This shop was sure to provide for many jobs. The workers filling those jobs would need somewhere to live, so Mr. Atkins seized the opportunity to purchase a 132 acre tract of land between Broadway and Central Ave. The land was covered in hardwoods, primarily oaks, which were perfect for the manufacture of mantels. Atkin used the trees for manufacturing at a factory he built there and sold the land as 300 (or so) divided lots with homes. We now know this neighborhood as Oakwood. The downtown factory and the new furniture factory in Oakwood supplied furniture to all points in the nation. Oakwood was not Atkin's final land deal. He and a business associate acquired the Knoxville and Fountain City Land Company in 1905. That deal included the Fountain City Duck Pond, the Hotel, the Park, and the dummy line. It was Atkin that set aside the land that is now known as Fountain City Park. He sold many homes and lots in the area. Mr. Atkin got into the hotel business in 1907, building the Colonial Hotel on Gay St. The hotel was on the same block as his furniture factory and was the nicest hotel in Knoxville at the time. In 1908, as head of the Auditorium Company, he was responsible for building the then current version of the Bijou Theater. In the early 1920's Atkin purchased the relatively new 10 story skyscraper on the corner of Gay St. and Clinch. He subsequently added to the south and east sides of the building, creating what we now know as the Burwell building (he named it after his wife's family). He was instrumental in the creation of the Tennessee Theater and he also owned the Mercantile and Plaza blocks downtown. In other words, Mr. Atkin was a major force in the formation of modern Knoxville. He died at age 67 in 1931. Of Mr. Atkin's properties, the flagship was the Hotel Atkin, built between 1910-1913. The hotel was built on the corner of Gay Street and Depot Street, directly across from the Southern Railway Depot. 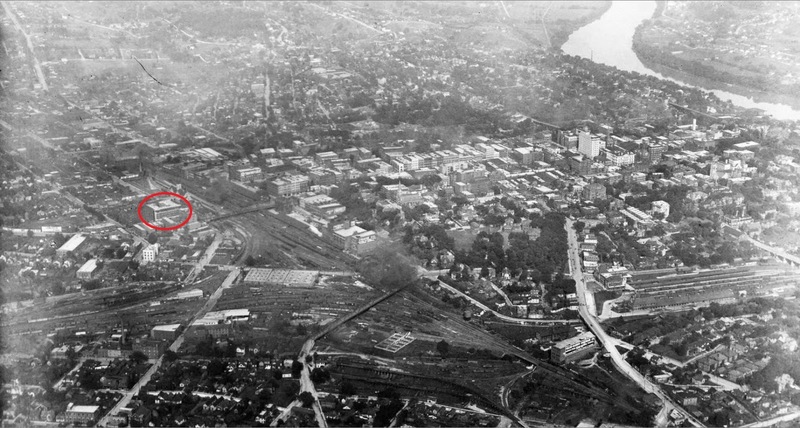 Occupying that prominent corner, it was literally the gateway to Knoxville. Before construction of the hotel, the corner was home to several shanty-like businesses (saloons, boarding houses, and the like). One such business, ironically, was a boarding house called the Atkin House. Many folks believed that Mr. Atkin was deluded building a hotel on the northern outskirts of town, but he saw the potential for Knoxville to grow northward. The hotel was constructed with 200 rooms, 135 of which had baths. Reportedly, one could get from the train to a room in five minutes. The hotel opened during the Appalachian Exposition. Several dignitaries stayed there, including Walter Damrosch, Albert Spalding, and President Howard Taft. The lobby of the hotel had two entrances, one on Gay Street and one on Depot. As the hotel was near the train station, it played home to many traveling salesmen. It had rooms that the salesmen could rent to sell their wares. The hotel housed an Economy Drug Store, a barbershop, and a dining room. The dining room, which was remembered by Knoxvillians for many decades after it disappeared, opened onto Depot. The dining room featured a young female violinist. Her name was Bertha Roth and she played a 17th century Maggini violin. Walter Damrosch, a famous New York conductor, heard her play in the dining room. Later he wrote that he had never heard a woman "get such tones from a violin." Ms. Roth went on to found the Knoxville Symphony Orchestra. Another locally famous figure with employment ties to the Atkin dining room was John J. Duncan, Sr. A young Representative Duncan once worked as a night clerk at the hotel while he attended the University of Tennssee. The hotel had an "Eco-magneto" clock, full electricity, steam heat, and a sprinkler system. In an article touting the benefits of sprinkler systems, one October 1916 letter written by CB reports that a bed caught fire in the hotel while 200 guests were present. The sprinklers limited damage to $100 and no disturbance was caused. Physically the hotel was massive, encompassing half of a city block. It was five stories tall, constructed of deep red brick with light stone embellishments. The roof was hipped at the eaves and composed of Mediterranean style tiles along the perimeter. The corners of the building are often depicted as holding large, flying flags. The Hotel Atkin on the corner of Gay and Depot. The main entrances are covered by ornate awnings. This is now a parking lot. Hotel Atkin with Economy Drugstore on the corner. 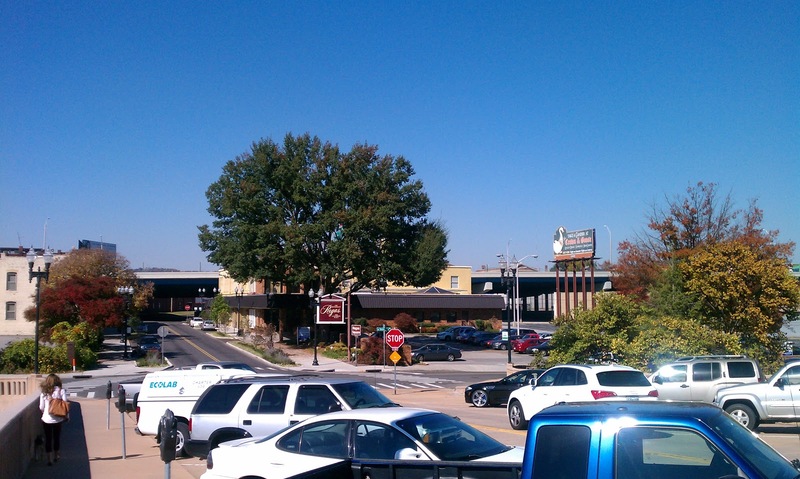 The recent Regas restaurant was located toward the left of the photo under the Hotel Watauga sign. Note how nice the street looks without the interstate bridges. The Economy Drug Store sold aristocratic candies! Dandy folks going about their day at the Hotel Atkin. The barbers' chairs at the Hotel Atkin. As the circus came to town, passing in front of Knoxville's grand hotel. A great shot of the Hotel Atkin, looking north up Gay St. Note how North Knoxville flows into Downtown with the lack of I-40. Depot Street from further out. Central Hotel on left, Hotel Atkin Center, Southern Hotel on far right. The railroad depot, the small buildings on the far left, and the small buildings on the left side of Gay St. are all that still stand today. Note the Tennessee River on the right. Railroad tracks bisect the city. Hotel Atkin is left. Same tracks, new road, shrunken neighborhood. Just look at all of those parking lots! The site of the Hotel Atkin across from the Southern Railroad depot. Showing the sites of the large hotels. So what happened? Railroad travel all but ceased in the South. That certainly had a lot to do with the demise of the Hotel Atkin. The interstate may have had something to do with it. 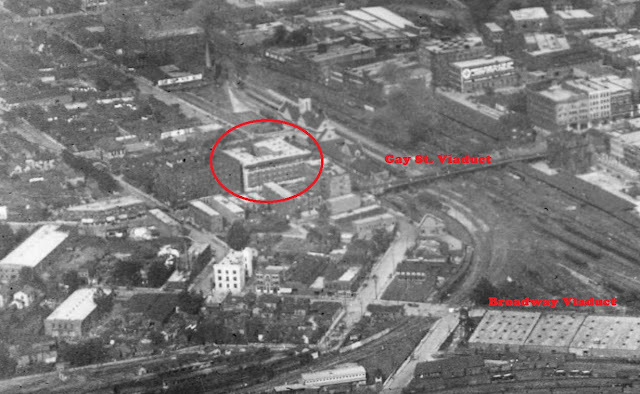 When the expressway first appeared in Knoxville there was a Gay Street exit. Then there's that always present mantra that there is "no parking downtown." A quick look at the aerial photos above should be enough to dispel that notion. So, what is the verdict? There are two stories about how the Atkin came down. The first is from an interview with Bill Regas. Regas states that his mother and father got married in the dining room of the Atkin. He then reluctantly goes on to say that "the family demolished the old hotel to build a 177-space parking lot. Although it was painful for the Regas kin to see the old structure collapse, the availability of that much parking kept the restaurant downtown, at its original location." Unfortunately, we now have neither the Regas restaurant nor the Hotel Atkin. The other story comes from a 1966 newspaper article written just as the building was being demolished. In that article, John Kennedy Craig, president of the Atkin Hotel Company, said that the "old hotel has done well financially but that the site will be more valuable if put to some other use, pointing out that it is close to I-40." Almost 50 years later, the site is still vacant. Perhaps Mr. Craig's prediction was a little off. Whatever the case, the Atkin came down in June of 1966. It was one of many 1960's demolitions that created the many vacant spaces currently found in downtown Knoxville. If one were to visit St. Augustine, Florida to see the Ponce De Leon hotel, or French Lick Springs, Indiana to see the grand resorts there, one may see a glimpse of what we lost when we lost the Atkin. It was truly a grand old hotel. Until next time when another lost piece of Knoxville will be found. Downtown Knoxville would be amazing today if we had all the old buildings and layout from 100 years ago. It’s nice to look at the old pictures, reminiscing the time and the way it look before. Atkin Hotel stood still the test of time continuing to provide good services and amenities to guests. Thanks for another great article and photo research. Will there be a new future for that block? Maybe. A small detail--according to the Knoxville Symphony's biography of Bertha Walburn Clark, her maiden name was Roth, not Ross. Did you find contradictory info? No, you are correct. I was relying on info from a 1960's newspaper article. Her name is Roth not Ross. Good catch. How beautiful is that....love that. Good question, and I've seen those stairs many times. There wasn't anything too exciting up there, just 5 Victorian era houses that look similar to the ones you find in the Old Sevier neighborhood. Man, I wish downtown still had that feel. Granted I avoid it like the plague (since there's no parking)... Just kidding. Are there any areas where you'd recommend walking around in the present day? I love this blog...great work and work that needs to bd done. Thank you so much. I think though that the C.B Atkin House sat squarely on half that block where the Bank of America Building is now and the McClung mansion sat squarely where the 1st Baptist Church sits now. I think that's provable by paying more attention to the side views in old photos to see what was near. Most of the images I've seen of both houses have them laying out like this as does the Sanborne Maps. Keep up the great job man....Love this stuff and you're so thorough.